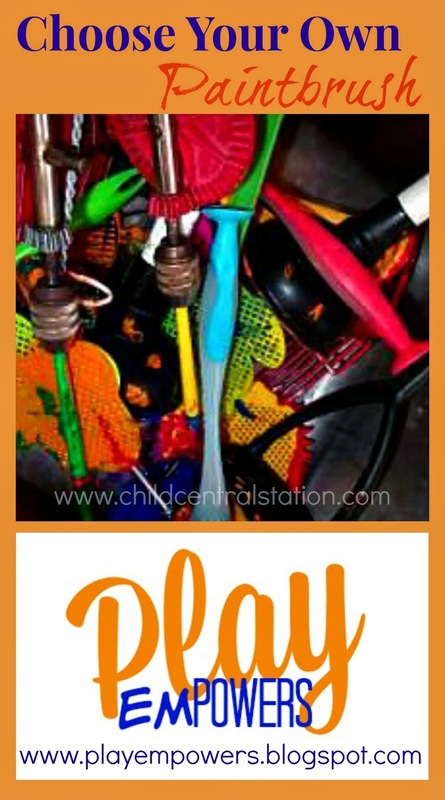 Embracing play, and child led investigations means letting go of adult agendas. It means dropping your preconceived ideas of what "needs" to happen at the door, and it means trusting the children. You may have some ideas of what might happen, but what or how things happen are not your decision to make. The investigation belongs to the children. It does not mean that you as an adult don't have a role. It means that your job is to follow and to help meet the needs of each child, you are there to assist when needed and to be an invisible support. In the art area it means being ready to help change out paper, refilling paint containers, and assisting children to navigate social situations when needed. It also means cleaning and refreshing places so that it is ready for the next child. This is HARD! I know- to let go of all of the "cute" projects and crafts that take you hours to prepare, and children seconds to complete. (or were primarily completed by adults because the child could not make it happen on their own). 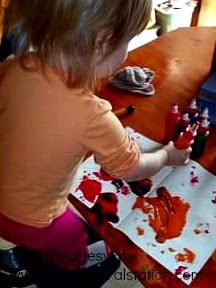 Early childhood art is about the process-- not the product. Yet, so many of the marketed "curriculum" out there offer product orientated experiences for children and don't even get me started on the amount of projects shared online via social media that really, are truly not developmentally appropriate and focus far too much on the product. 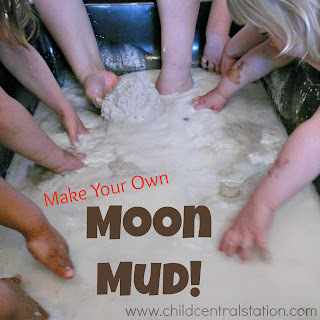 Art for young children needs to be about exploring and investigating materials. 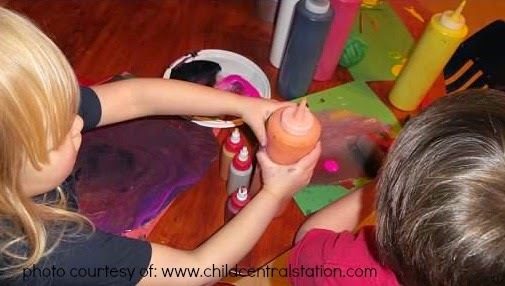 When children are truly engaged these experiences could take hours, or even days. The process is often repeated again, and again, and again. Children need an opportunity to continue to explore, to master and to choose to engage until they have exhausted their curiosities. This could mean more paper, and more paper, and more paint, and more paint.... and the same thing for a month (or even longer). This is where you need to remember to trust the child-- they know when they are ready to move on. They know if they still need to explore, and as Bev Bos says they need to use too much before they understand to use just enough. At my house (remember, I run a home based program), we have a rather large art area and tinkering station. The children have almost unlimited access to the materials. (The art area is located in our kitchen and the table is the same table we eat at, so we do need to make sure that we are able to serve meals and limit art activities to outside of meal times). When children choose to create art, they choose their canvas- various types of paper, plexi-glass, and random other objects (wood chunks, cardboard boxes..... ) They choose if they want to paint at the easel, at the table, on the floor..... the children choose what they would like to use- crayons, pencils, markers, paint..... and what color or type of each. 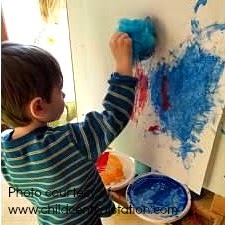 Children almost always choose paint-- and when they choose paint, they also have to choose their "paintbrush"
Our art area is stocked with a vast array of "paintbrushes"-- all kinds of odds and ends. It is amazing to see the explorations that happen when children can choose and use different types of things to paint with. It is also interesting to see what the children come up with- and what explorations or "paint brushes" they bring to the area. You can find some more idea by following my Pinterest Board WE LOVE PAINT! 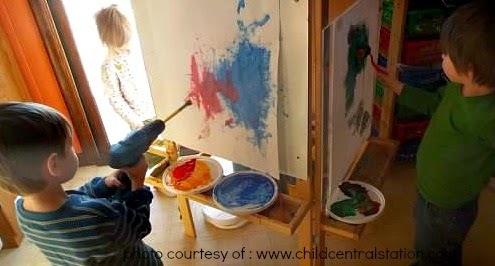 What is your favorite paintbrush to supply to the children? Please stop by and share on the Play EmPowers Community Facebook page or leave me a comment below!